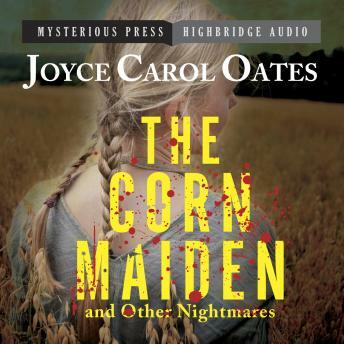 An incomparable master storyteller in all forms, in The Corn Maiden and Other Nightmares Joyce Carol Oates spins seven imaginative tales of suspense. "The Corn Maiden" is the gut-wrenching story of Marissa, a beautiful and sweet, but somewhat slow, eleven-year-old girl with hair the color of corn silk. Her single mother comes home one night to find her missing and panics, frantically knocking on the doors of her neighbors. She finally calls the police, who want to know why she left her young daughter alone until 8:00 o'clock. Suspicion falls on a computer teacher at her school with no alibi for the time of the abduction. Obvious clues, perhaps too obvious, point directly to him. Unsuspected is Judah (born Judith), an older girl from the same school who has told two friends in her thrall of the Indian legend of the Corn Maiden, a girl sacrificed to ensure a good crop. The seemingly inevitable fate of Marissa becomes ever more terrifying as Judah relishes her power, leading to unbearable tension with a shocking conclusion. "Helping Hands," published here for the first time, begins with an apparently optimistic line: "He came into her life when it had seemed to her that her life was finished." A lonely woman meets a man in the unlikely clutter of a dingy charity shop and extends friendliness, which soon turns to quiet and unacknowledged desire. With the mind-set of a victim, struggling to overcome her shyness and fears, she has no idea what kinds of doors she may be opening. The powerful stories in this extraordinary collection further enhance Joyce Carol Oates’s standing as one of the world's greatest writers of suspense.